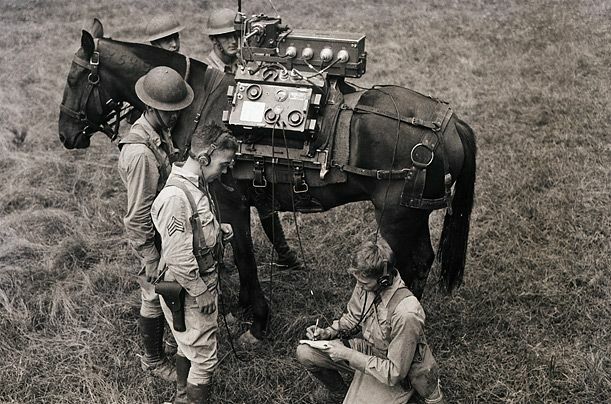 Yesterday, I stumbled upon this 1940 photograph of the US Army Signal Corps communicating via radio in the field. I bet that radio kit weighs almost as much as or more than the typical soldier! Does anyone know what model of Signal Corps radio that would be? The original photo is at the site below. Thanks so much for identifying the equipment, Richard! This entry was posted in Boat Anchors, News, Radio History, Shortwave Radio and tagged Army Signal Corps, Signal Corps, US Signal Corps, US Signal Corps Horse on March 21, 2016 by Thomas. Want a “new in box” Signal Corps BC-454-B? My buddy, Eric (WD8RIF) noticed a rather unique find on eBay this morning: a “new in box” Signal Corps Western Electric BC-454-B receiver. While BC-454-Bs are far from rare, it is certainly a treat to find one with its original box and in mint condition. This entry was posted in Boat Anchors, News, Radios, Shortwave Radio and tagged BC-454-B, eBay, Signal Corps on January 13, 2015 by Thomas.